all children of Zion, rejoice and give praise. with robes of salvation adorning the meek. all rulers and nations shall yield to their sway. To God give the glory; sing praises for aye. and have given us victory through our Lord Jesus Christ. so that we may faithfully struggle for peace and justice everywhere. Amen. 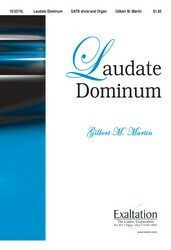 LAUDATE DOMINUM (Latin words for the opening phrase of Psalm 150) comes from the end of the anthem "Hear My Words, O Ye People" by C. Hubert H. Parry, an anthem he composed in 1894 for a festival of the Salisbury Diocesan Choral Association. 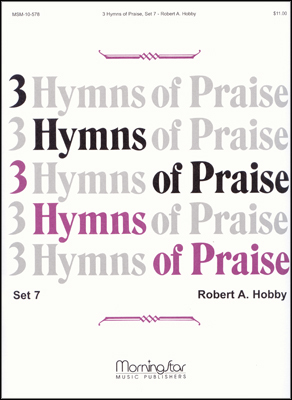 Parry's tune was set to Baker's text in the 1916 Supplement of Hymns Ancient and Modern, replacing an earlier LAUDATE DOMINUM by Henry J. Gauntlett for Baker's text. 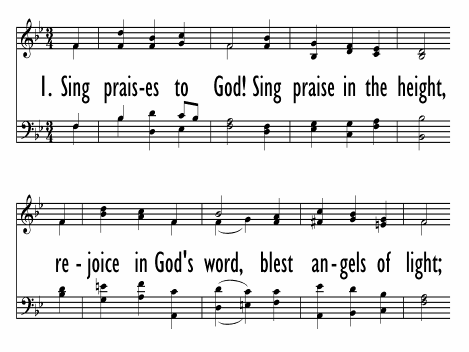 Parry's tune is an inspired melody from a great tune writer who rarely came to church but who produced some of the best hymn tunes in the later Victorian era. Sir Charles Hubert Hastings Parry, 1st Baronet (b. February 27, 1848; d. October 7, 1918) was an English composer, teacher and historian of music. Parry's first major works appeared in 1880. As a composer he is best known for the choral song Jerusalem, the coronation anthem I Was Glad, and the hymn tune Repton, which sets the words "Dear Lord and Father of Mankind." He was director of the Royal College of Music from 1895 until his death and was also professor of music at the University of Oxford from 1900 to 1908. He also wrote several books about music and music history. Some contemporaries rated him as the finest English composer since Henry Purcell, but his academic duties prevented him from devoting all his energies to composition.